Part of Raleigh’s Open Road line, but an excellent option for both cyclocross and rides with varying terrain, the Raleigh RXC is designed with sculpted top tube for easy carrying, along with front and rear thru-axels for added stiffness and handling. To compliment the frame, the RXC is spec’d with a Shimano 105 drivetrain, Clement PDX tire, mechanical shifters and hydraulic brakes. 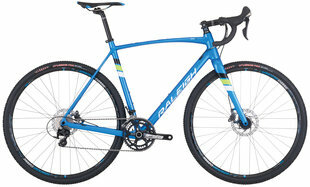 Editor's Quote: ".... Raleigh RXC, a model that's ideal for both cyclocross racing and enjoying the back roads."